Campaign season is beginning to heat up in West New York. Throughout the better part of the past year, elected officials have been engaged in what amounts to a civil war. Three West New York commissioners are now officially campaigning in a five-person slate to challenge Mayor Felix Roque’s incumbency. Commissioners Gabriel Rodriguez, Cosmo Cirillo, and Margarita A. Guzman, along with Victor M. Barrera and Yoleisy Yanez, kicked things off at an event held on Jan. 18. Their slate, called “New Beginnings West New York,” got several critical endorsements. The turnout at the first New Beginnings event signified the number of establishment allies across Hudson County who are seeking new leadership for the town. The slate received county backing from Congressman Albio Sires; Hudson County Democratic Organization Chair Amy DeGise; County Executive Tom DeGise; Assemblywoman Angelica Jimenez; North Bergen Mayor Nicholas Sacco; North Bergen Commissioner Julio Marenco; County Freeholders Chair Anthony Vainieri; Weehawken Mayor Richard Turner; Guttenberg Mayor Wayne Zitt; and Sal Vega, former West New York mayor whom Roque unseated in 2011. 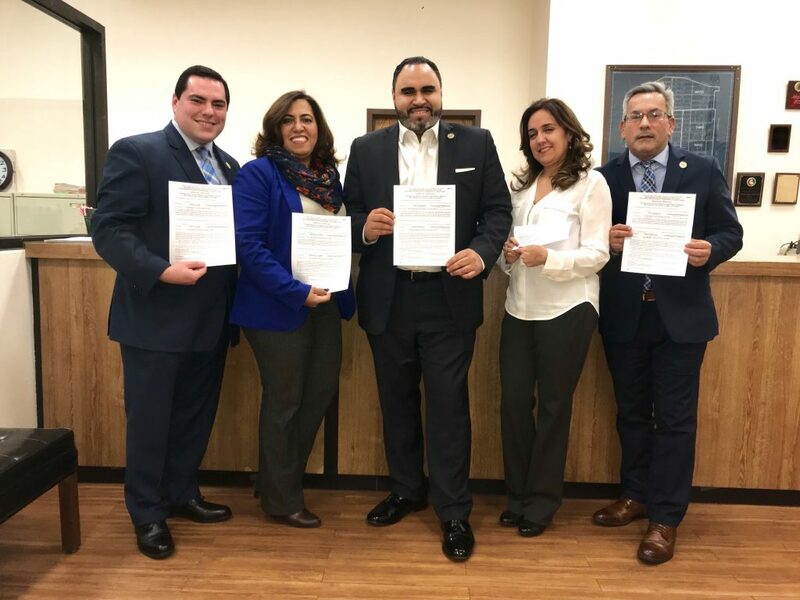 Elected officials on the West New York end included Board of Education President Adam Parkinson, along with Board of Ed trustees Adrienne Sires and Jonathan Castaneda. Commissioner Rodriguez is the township’s director of revenue and finance, and will be heading the New Beginnings slate as a mayoral hopeful. He also serves as a campaign finance director for Congressman Sires. Commissioner Cosmo Cirillo is director of public affairs, has past experience on the West New York Board of Education, and currently serves as town administrator in Gutenberg. He also served as a senior adviser to Assemblyman Vincent Prieto. Commissioner Margarita A. Guzman currently serves as director of parks and public property, as well as cultural affairs in the current administration. Victor M. Barrera, a newly announced New Beginnings member, is currently a volunteer commissioner for the West New York Parking Authority. Previously he served as the town’s director of Senior Citizen Services and trustee of West New York’s Board of Education and Planning Board. He hosts an adult day care in town which is home for hundreds of local seniors. Yoleisy Yanez, also newly announced, currently serves as supervisor of special education in West New York’s school district. “Make no mistake about it, West New York is at a crossroads,” Cirillo said. “We have an outstanding team of individuals who truly care about the future of this town.” Cirillo said that while he and his team have been able to “do the right thing,” it had been very difficult over the past four years he’s served as a commissioner. Rodriguez urged attendees to keep talking to neighbors and families about change they want to see in town, and to demand more from the current administration. With the campaign aiming to unseat Roque in full swing, it’s still unclear who will join Roque on his ticket; Susan Colacurcio, currently on the board of commissioners, has been floated as a possibility.